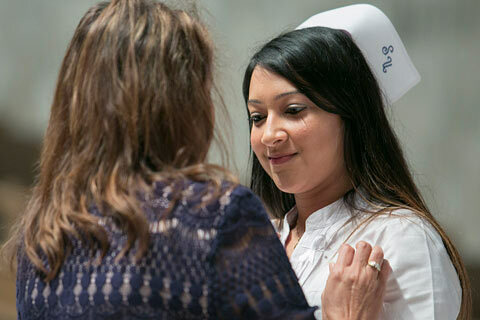 Samford University’s Ida Moffett School of Nursing honored graduates from its inaugural class of second-degree 12-month accelerated Bachelor of Science in Nursing program at a pinning ceremony May 5. The 17 students who graduated from the accelerated program completed the same learning outcomes as traditional B.S.N. students, but in a different method and much shorter time. “This class is nothing short of extraordinary,” said Lisa Gurley, assistant professor and coordinator of the program. Prior to graduation, 76 percent of the class had secured employment; many finding jobs in critical care units at hospitals such as Brookwood Baptist Medical Center in Birmingham, Vanderbilt Medical Center, Emory Medical Center and Duke University Hospital. The pinning ceremony, which in appearance is identical to the traditional pinning ceremony Samford holds for all undergraduate nursing students, had a special, personalized tone that set the ceremony apart. Austin Mills, the ceremony’s student speaker, mentioned each of his classmates by name, offering a kind memory or a funny antidote, and assistant professor Abbey Holthaus took the graduates “down memory lane using assessment and the nursing process,” she said. Holthaus told graduates to be confident in their education, confirming that they are competent and compassionate nurses. The symbolism of the nursing pinning ceremony dates back to Florence Nightingale, known as the founder of the modern nursing. Each school has a unique pin. The pin used by Ida Moffett School of Nursing was designed by the Class of 1974, and it serves as a reminder to nurses of the commitment to a life of service to others. During the ceremony, Reshma Patel was named this year’s recipient of the Nightingale Award. While Ida Moffett School of Nursing’s accelerated B.S.N. program first began in 2009, the program transitioned this past year from being an 18-month program to a 12-month program. Students are trained under a concept-based curriculum that allows them to use nursing concepts as building blocks to gain knowledge and apply skills.